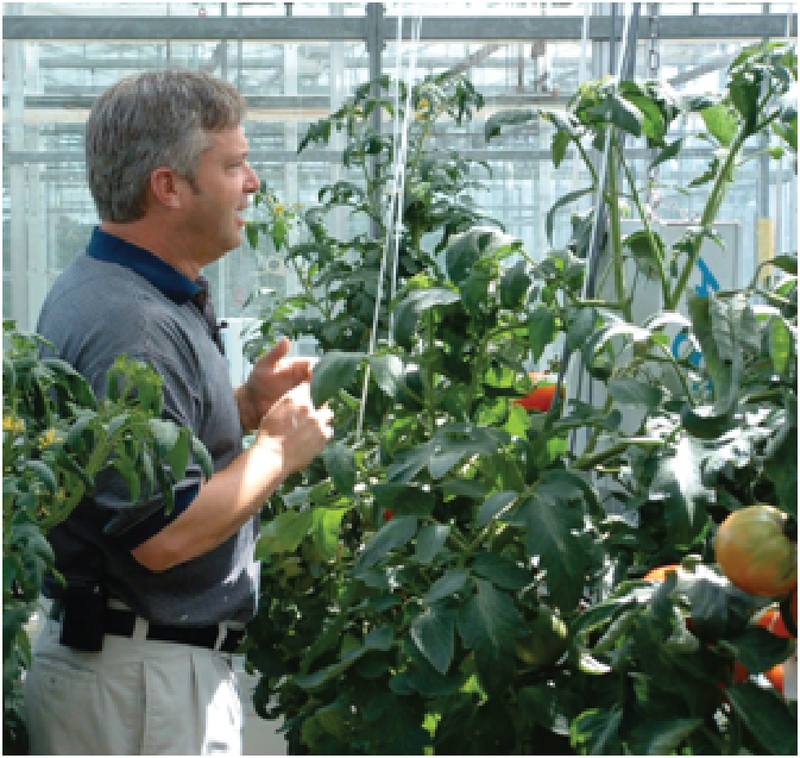 What do the photovoltaic array shown below on the left, and the tomato plant, shown with TomatosphereTM Principal Investigator, Dr. Michael Dixon, have in common? They both convert sunlight, (radiant energy), into forms useful to humans. 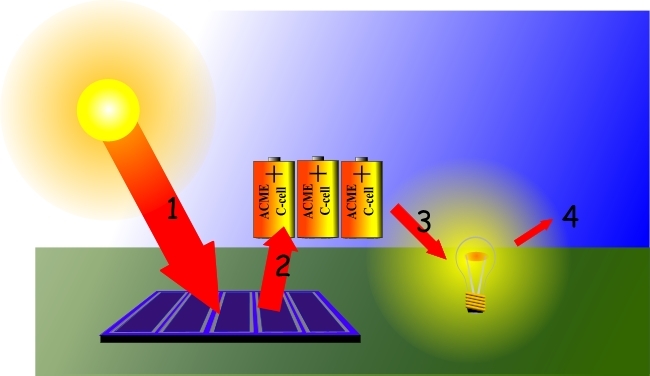 The photovoltaic array absorbs solar energy and stores it as chemical potential energy in batteries. The leaves of the tomato plant absorb solar energy that is (mainly) stored as chemical potential energy in compounds called carbohydrates. 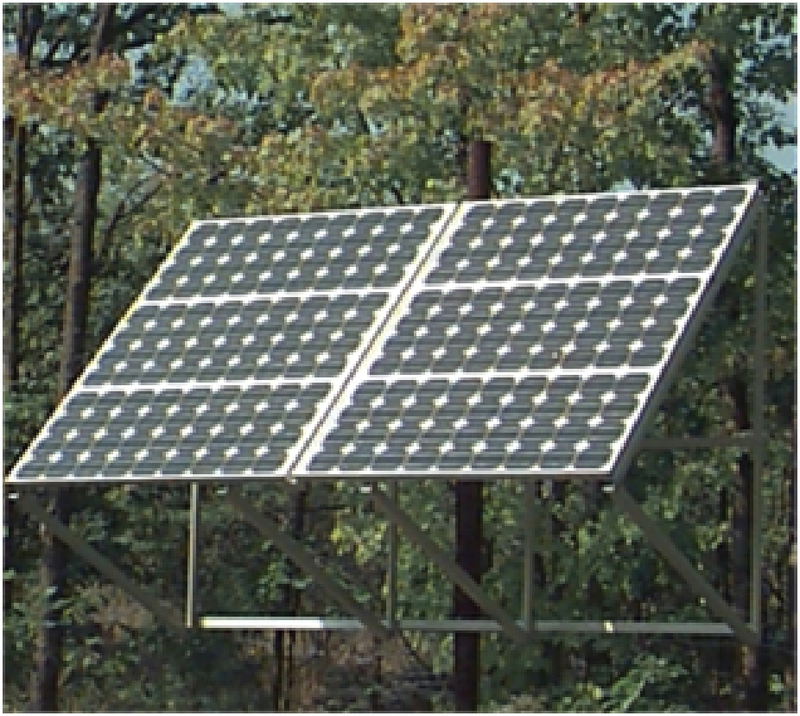 Photovoltaic cells are well known for their ability to convert solar energy (1) into electrical energy. Because sunlight is usually not available for 24 hours every day, electrical energy (2) needs to be stored to accommodate those times when there is no sunshine. Groups of voltaic cells, called batteries, are used to store the electrical energy in a chemical form (in molecular bonds). This is illustrated in the diagram above. When a light bulb is attached to the cells, the cells convert chemical energy back into electrical energy (3), and the electrical energy creates heat in the light bulb filament. The hot light bulb filament radiates light energy (4). It is important to note that at each step in the energy transformation (along the energy path), only a little of the energy is actually transferred; most of the energy is lost at each step as heat. Plants also convert sunlight into other forms of energy. In this case plants convert light energy (1) into chemical energy, (in molecular bonds), through a process known as photosynthesis. Most of this energy is stored in compounds called carbohydrates. The plants convert a tiny amount of the light they receive into food energy. When animals eat green plants (2) they consume and absorb some of this energy, which stored as chemical energy in compounds known as fats and protein. 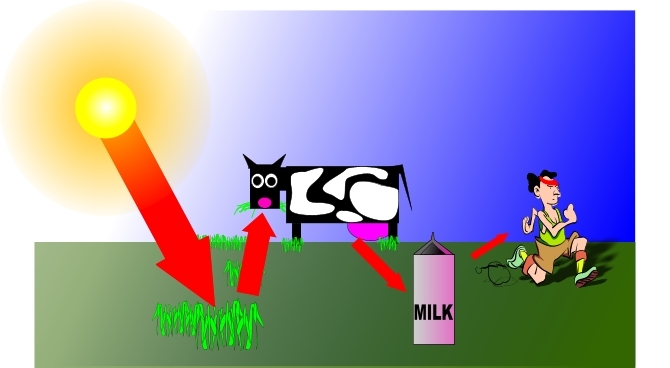 Milk from cows is a good source of solar energy (3), (also an excellent source of essential vitamins and minerals). When we drink milk our bodies convert the energy stored in the milk into energy for running, playing and important metabolic activities (4). We have become “solar powered”! Two student activities are provided in the Classroom Curriculum Documents section.